Nathan Clarke is no stranger to big FA Cup occasions. 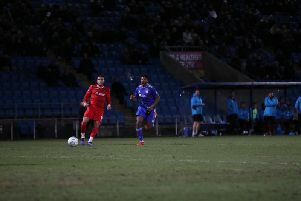 The Town defender is in his 16th cup campaign, the highlights of which are two ties at Chelsea while with Huddersfield Town. Clarke was part of the Terriers side that lost 2-1 at Stamford Bridge in January 2006, and also played in their 3-1 defeat two years later. “The FA Cup is an opportunity to come up against some fantastic teams. I was lucky enough to play against Chelsea, and the whole build-up to it and everything surrounding it was fantastic,” Clarke recalled. “Seeing the Huddersfield fans - they filled the whole away side which was great. “During the warm-up you’re trying to spot your friends and family. “It was a great opportunity for us. It wasn’t the right result but the experience that we took from that, and being invited into the dressing room afterwards to meet the players and get our shirts signed, was something you never forget. “I remember getting assigned to mark John Terry at corners and free-kicks. “It was a bit of an eye-opener. He was a fantastic player, great captain for Chelsea. Clarke is quietly confident about Town’s chances against League One side AFC Wimbledon on Saturday in their televised lunchtime clash at The Shay. “We’re going in as underdogs,” he said. “Wimbledon are a fantastic team, I know certain players there that have had fantastic careers, and still doing really well. “It’s not going to be easy. We’re going to need another Morecambe performance where everyone is an eight or nine out of 10. “We hope their players underestimate us possibly and have an off day. “I’ve been on the other side of it where you’re playing a lower league side and you tend to underestimate the players, and hopefully Wimbledon do that with us. When asked what he felt the ingredients were over the years for teams who had caused a cup upset, Clarke said: “They’ve had the fight, the belief that they can win. “Sometimes it’s that one game where players think ‘we need to step up and be counted’. “It’s not just one or two that need to do that, it’s the whole squad, the players that come off the bench need to be ready to help. It could be a case of which Town team turns up on the day, after their terrific win over Morecambe in the last round of the cup preceded a miserable 4-0 league defeat at Ebbsfleet last Saturday. “As frustrating as it is, that’s how we’ve been of late and it’s something we’re desperately trying to put right,” Clarke said. “Trying to put your finger on why it’s like that is very hard. “But we’re fully focused, training really hard, and we’re looking forward to it. It’s something to enjoy. Clarke is under no illusions about what it could mean for Town if they progressed to the third round. “The last round was big for the club, and when you keep progressing like this it can only help the players’ confidence, but off the pitch it gives that buzz and feel-good factor around the club. “Hopefully that rubs off in our league performances as well. Going forward, it’s massive for the club if we can get through this round and possibly get one of the bigger teams.